The new prototype pod unveiled by Virgin Hyperloop One. The 87-mile (140 kilometers) journey usually takes 90 minutes by car, but the Hyperloop will take a mere 12 minutes, thanks to its innovative track — a long tube that has had its air removed to create a vacuum inside, according to the Daily Mail. 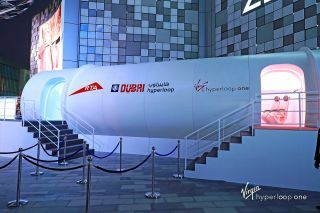 Virgin unveiled the pod — which will be accelerated by an electromagnetic propulsion system within the vacuum tube — in conjunction with Dubai's Road Transport Authority (RTA) during Innovation Week in the United Arab Emirates yesterday (Feb. 22). The company plans to have three working Hyperloop systems in service by 2021, it said on its website. Given the Hyperloop's high speeds, passengers will have to stay buckled in, but at least they'll be able to do it in style, as BMW has designed the pod's leather seats, according to the Khaleej Times, a Dubai newspaper. "There will be no windows," Abdulredha Abu Alhassan, executive director of the Rail Planning and Projects Development at the RTA, told the Khaleej Times. "However, there will be interactive entertainment screens at the arm rest of the seats." A Hyperloop system fits perfectly into the RTA's goal of having 25 percent of all transportation in the country to be driverless by 2030, according to the Daily Mail. The pod prototype isn't the only Hyperloop news making the rounds. On Feb. 18, Richard Branson, the CEO of Virgin Group, announced that his company would also build a Hyperloop between Pune and Mumbai, in India, according to the Virgin Hyperloop One website. Meanwhile, Elon Musk's company, The Boring Co., received preliminary approval to begin digging a Hyperloop tunnel beneath Washington, D.C., Live Science previously reported.